When looking at complications that could arise during hair restoration surgery, a very important question to ask would be what type of surgery is being offered. 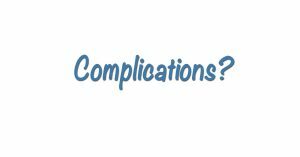 Some procedures may have more complications than others. One procedure you may have heard of is called Follicular Unit Transplantation (FUT). This treatment, also known as “strip surgery,” involves taking hair follicular units harvested from a strip of skin removed from the scalp. FUT requires sutures or staples to close the wound. According to the Encyclopedia of Surgery website, complications include the potential for infections and scarring. You’ll usually need prescription pain medication once the FUT procedure is finished. Patients do report lingering pain, tightness of scalp, tingling, and numbness after the procedure is over. It can leave a linear scar which can be visible if you cut your hair short. The other type of hair restoration surgery you might have heard of is Follicular Unit Extraction (FUE). Instead of harvesting strips of skin, hair is transplanted individually from donation areas, usually from the back and sides of the head. Unlike FUT procedures, the transplant is virtually pain-free with only minor swelling once it’s over. There are no incisions or stitches, and you may not even need pain medication. The complications that do come from FUE can depend on the type of procedure you have done. While the ARTAS® System uses robotic precision to identify select hairs from donor areas and transfer them to give you a natural, healthy head of hair, other FUE procedures are done by surgeons using handheld devices, which don’t have the accuracy of the ARTAS® System. One complication that can occur when an FUE procedure isn’t as accurate as it could be is over-harvesting of hair follicles. Dr. Marc Dauer a hair restoration specialist in Los Angeles told Yahoo Health that over-harvesting occurs when too many hair follicles are taken from a donor area, creating bald patches. Overall, the risks of hair restoration surgery are “very minimal” according to Dr. Dauer who added that the biggest complication recently may be that people are seeking treatment from people who aren’t qualified to do transplants. “Unfortunately, there are lots of unlicensed health practitioners performing this procedure and people are not getting the results they should,” he said. At RHRLI, our Board-Certified Surgeon, Dr. Baiju C. Gohil, MD is involved in all of the surgical procedures in our office. He has been practicing for more than a decade. When you come to our office, we’ll take you through all of the steps of our Robotic FUE procedure. To get started, contact us today. Previous Post: « Can Aging DNA Cause Hair Loss?